Phil Jacob took home the Best New Maker award from BLADE Show 2017, which is as good as it gets for someone getting started in knifemaking. 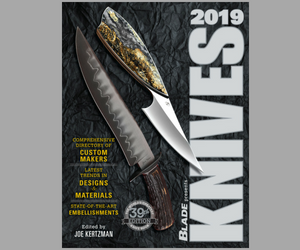 The achievement is also good news for knife collectors looking for a guiding light for their collections. “Best New Maker” translates to “best new opportunity” for ROIs on investment. Jacob, who calls Kansas home, specializes in slip joint folders. The addition of exotic handle materials and attention to detail offset any cliches about this traditional style. Just take a look at the double-bladed trapper that made waves at BLADE Show. Jacob maintains a healthy social media presence, which is another benefit to collectors interested in a commission or a resale. His Facebook page is full of status updates and photos. And here are some photos of his recent work. Best of all, you can meet him at this year’s BLADE Show. Get tickets here.